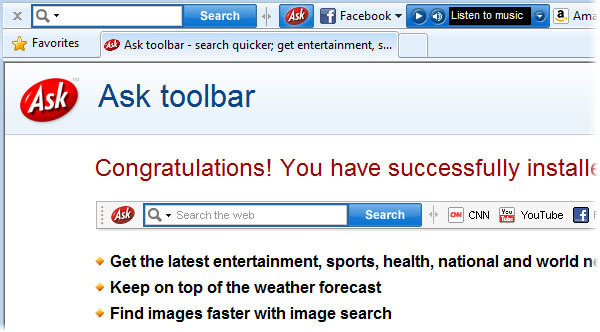 Ask Toolbar - Boost Your PC. The Ask Toolbar is a web-browser add-on that can appear as an extra bar added to the browser's window and/or menu. It is often installed (sometimes without warning) during the installation of other software. Ask.com has entered into partnerships with some software security vendors, whereby they are paid to distribute the toolbar alongside their software. When you use the Toolbar to submit a query, the Toolbar forwards such query information to Ask servers. Ask.com uses this information to process your web search requests and to return a search results page to you. Download Boost and enjoy your PC. Remove Ask Toolbar from your PC. Why should I uninstall Ask Toolbar? The Ask.com Toolbar can potentially have adverse effect on your web browser's and overall PC's performance and stability. This toolbar is known to monitor your search queries and browsing habits in order to send you targeted ads and modify your search settings and results. To the right of the list item, click the Uninstall button and Boost will completely remove Ask Toolbar from your PC. Use Add/Remove Programs control panel in Windows makes to uninstall Ask Toolbar. Follow the appropriate instructions below to use this control panel. Select Ask Toolbar from the list of programs, and click Uninstall. Alternatively, right-click the program and select Uninstall. Select Ask Toolbar from the program list, and click Uninstall. Alternatively, right-click the program and select Uninstall. Select Ask Toolbar from the list of programs and click Remove. Boost helps you remove Ask Toolbar and optimize your PC.